If you’re poking around in the appliance repair technician field to try to determine if it might be the right career for you, we’ve got good news — you’ve come to the right place. In this article, we’ll dive into the ins and outs of what goes into being an appliance technician, discuss employment information, tell you all about the duties of an appliance technician, and even give you a step-by-step guide for becoming the ultimate, in-demand appliance technician you’ve always dreamed of. As an appliance repair technician, you’ll work with anything from dishwasher to air conditioning systems to microwaves to dryers — in other words, you’ll need to be fairly knowledgeable about large appliances, portable appliances, mechanical work, as well as electrical work. You’ll deal with more than just appliances, though, as a repair technician, you’ll have to deal with people, too. There are several requirements that you’ll need to ensure that you’re meeting, too. For example, appliance repair technicians must have a driver’s license, a clean driving record, a clean background check, and the ability to pass random drug tests. Appliance repair technicians must also have skills in high mechanical aptitude, have impeccable written and verbal communication skills, work adeptly with repair tools, be okay with lifting heavy machinery, and of course, be incredibly skilled in troubleshooting problems. As an appliance repair technician, you’ll need to be prepared to travel often, deal with ornery customers, work in uncomfortable positions and temperatures, and likely keep strange hours, too. You’ll likely need a good bit of training, a dollop of hard work instilled in your work ethic, and some educational courses in order to be come an appliance repair technician. Are you prepared to start your journey toward becoming an appliance technician? Check out our article below for answers to all the appliance technician questions you might have! What Does an Appliance Repair Technician Do? As an appliance repair technician, you’ll be known as the man or woman who can fix practically anything. If it’s a broken appliance — whether it’s a microwave or a dishwasher or an air conditioner — you’ll be in charge of fixing it. Typically, you’ll have to travel to the homes of your clients to fix their larger appliances (like refrigerators and washing machines), be familiar with mechanical and electrical systems, know the right tools for the right situation, and be comfortable working in service centers, too. It’s possible that you’ll have to take on both hands-on work and business tasks such as inventory, record keeping, invoicing, and more. As part of your job, you’ll have to deal with people on a regular basis, hone your communication skills, be comfortable visiting strangers’ homes, and be willing to participate in training and education to stay up-to-date on the latest technology. Typically, workers are responsible for understanding, installing, maintaining, and fixing things like electric systems, heating, air conditioning, refrigerators, and other types of mechanical or electrical appliances. So far, the appliance repair technician career sounds pretty good, right? You’ve read through the job description, and the idea of working with small and large appliances, traveling to customers’ homes, and being knowledgeable about different systems sounds thrilling. But that leads you to the next question — what does it pay? According to Salary.Com, repair technicians make a median base salary of about $49,411 with a range of $39,838-$60,042. The median wage, for those who are not aware of the statistic, is the wage at which half the workers in an occupation earned more than that amount and half earned less than that amount. The salary will vary from establishment to establishment and depend heavily on your certifications and experience. For example, according the Bureau of Labor Statistics, manufacturing repair people are able to make about $44,260 while real estate and rental repair folks typically make about $35,000. It all depends on the industry you find yourself in and how you can apply your repair skills. Depending on the state that you’re in and planning to become an appliance repair technician in, you might have different requirements. While there’s no national standard for appliance repair technicians, each state, as well as individual employers, will have specific qualifications for working as a technician. Ensure that you’re doing all the research necessary when you’re looking to become an appliance repair technician. While some establishments will require just a high school diploma or GED equivalent for employment (and then provide on the job training), many places will require that you receive applied technician training. Depending on the type of appliances you plan to work with, you’ll likely need education and training that includes coursework at a local college or a vocational program. You might also need to take additional training and participate in seminars regularly in order to stay up-to-date on the latest appliance technology. Taking specific courses on mechanical drawing, electricity, woodworking, blueprint reading, mathematics, computer systems and more will, more often than not, make you more of an in-demand worker than other appliance repair folks, too. There is also practical training available at tons of adult education centers, vocational schools, and community colleges. Perhaps even consider off-the-wall courses to help set yourself apart from other workers, such as drywall and basic plumbing. If you’d like to become an even more in-demand technician, consider getting certifications and specializations in particular appliances. For example, if you’re hoping to become a refrigerator-certified mechanic, consider passing the written test to become certified by the Environmental Protection Agency — that way, you can use chlorofluorocarbon which is regulated by the EPA. In addition to these requirements, qualified appliance repair technicians will be required to have a driver’s license, a relatively clean driving record, a clean background check, and the ability to pass random drug tests. Apprenticeships and on-the-job training are going to be a vital part of the appliance repair technician job. If you’re unable to find employment as a technician where you can learn on the job training, consider seeking out an internship or apprenticeship first. Read up on appliance manuals, attend seminars, and keep up to date on the latest appliance trends on your own in order to remain an in-demand technician. Training is going to be one of the most important factors in furthering your career. General maintenance and appliance repair workers can learn by watching skilled maintenance workers and fixing simple projects on their own (leaky faucets, replacing bulbs, etc.) before moving on to more sophisticated work. The more training you push yourself through, the more specializations you’ll be able to get, furthering your career and moving toward broader career options like electricians, mechanics, or plumbers. While some appliance technicians are only required to have their high school diploma or GED equivalent, there are some establishments and state requirements that might demand more education. For example, some places might require that you receive training at a community college, secondary school, or vocational program in order to qualify for a position as an appliance repair technician. 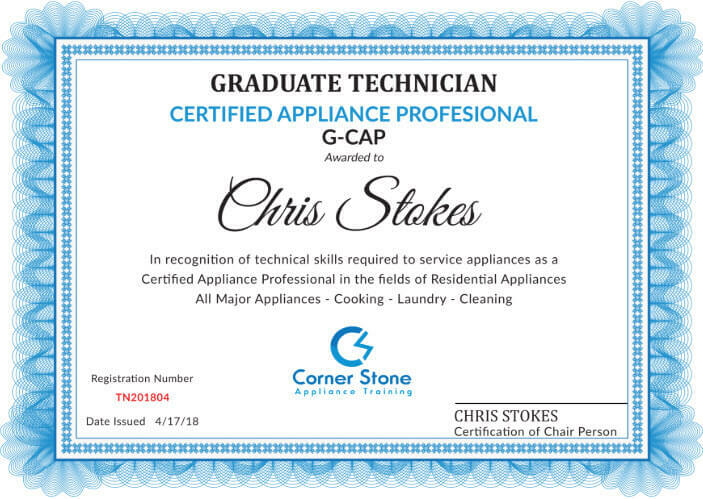 While no certifications are required in order to be a general appliance technician, you’ll need to gain certifications for specific appliances, such as refrigerators. Becoming certified in several different large appliances via vocational programs, specific brands, and other types of training will only make you a more in-demand and knowledgeable technician. According to the Bureau of Labor Statistics, the appliance repair technician industry is growing as fast as the average for all occupations in the United States. In other words, it’s not making any giant leaps or bounds in the growth department. It’s possible that employment will rise as the increasing home prices and sales drive demand for remodeling and maintenance work, but this is not a projected guarantee. According to BLS, this industry is projected to grow by 8 percent from 2016 to 2026. That's a higher than average projected growth of 112,500 jobs. Should You Become an Appliance Repair Technician? So, taking a look at the overall career path of an appliance repair technician, are you able to deduce if you’d like to become one? The satisfaction rate, overall, is rated at a moderate score of medium. The work involved certainly requires training and education, a well as staying up-to-date constantly with the growing technology. More than that, the BLS lists this as an average growth job with a low ceiling, so the opportunities might not be plentiful. The salary is quite average by national standards as well, but the work proves rewarding for those who enjoy a challenge. The average salary of an appliance repair technician is listed as $49,411, which is quite normal compared to the national average. The job growth outlook for this career is considered low with a projected rate of just 8 percent growth by 2026. The education duration of this career might only require a high school diploma or a GED equivalent, but the actual training and education is rather lengthy if you’re required to get a vocational education or take training through a community college or seminar. Q. How Much Can a Self-Employed Appliance Technician Make? A self-employed technician will likely make an average salary of $49,411. That being said, it’s likely that you could make a salary ranging from $22,800 to about $61,000. Your salary will always depend on the line of work you’re planning to specialize in, the state you’re in, the demand of your work, your experience and your specializations. Q. 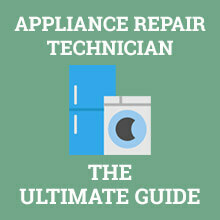 What Does an Appliance Technician Do? An appliance repair technician is responsible or installing, maintaining, and fixing large and small appliances. They are responsible for installing ,fixing, and maintaining machines, mechanical equipment, and electrical equipment. They will likely assemble and set up machinery or equipment, read and use blueprints and diagrams, do general cleaning and repair work, and meet with clients in order to estimate the work necessary and the kind of parts and supplies they’ll need. Q. How Long Does it Take to be an Appliance Technician? It depends on the state and establishment requirements. For some, apprenticeship and on-the-job-training is enough, for others, you’ll need vocational education. Some training programs require no more than a few weeks of training, but some educational programs will likely require about a year of courses. Q. How Many Hours a Day do You Work as an Appliance Technician? Typically, if you work for yourself, you can set your own hours, but there are many appliance repair technicians that will set up inconvenient hours. For example, if you choose to be an appliance repair person for an apartment complex, it’s likely that you’ll be on call for some of your shifts and might be required to fix appliances and other systems at all hours of the night. It will simply depend on the establishment you work for and the nature of your specialization. Q. What Skills Do You Need as An Appliance Technician? As an appliance technician, you will need electrical and mechanical skills, people skills, and communication skills. You will need excellent problem solving skills, creativity, and must have a knack for troubleshooting. You will likely need to be technically and mechanically inclined, be a good sales person, have logical reasoning skills, and have excellent listening skills. Learning as an apprentice is the best way to begin and the coolest way to get hands-on experience in a comfortable way. I started as one and it’s nice and I can boast of a good job now. I always try to fix appliances in my house and though I started it as a hobby, it has grown to something bigger. Just be passionate about whatever you do and you are good. I actually have a passion for fixing stuff and I think I can make something out of this and build a career around it. I love the idea of looking for problems and trying to solve it, I do believe this is a good way to start. Cool one I must say. To be honest, this is a lot of information to take in and I think I’ll go easy on it and see if I can make it work. LOL. My boy is always rummaging around and trying to fix appliances and I think he would be good in that aspect. This should help him.